Peter Young took this photo in the run-up to Christmas, 22 December 1973. No people around, just a few gulls. In contrast an aerial view from 1929 shows many railway tracks loaded with freight (and no tower blocks of course). The sign reads 'No craft to proceed beyond this point until amber light indicates which lock is to be used' and the craft is a Thames & General Lightage vessel. The tower block features on another of Peter's photos but has since gone. Janet McNamara wrote in December 2017 with more details of the swingbridge location: it’s on the canal just above the Gauging Lock with the Depot opposite. 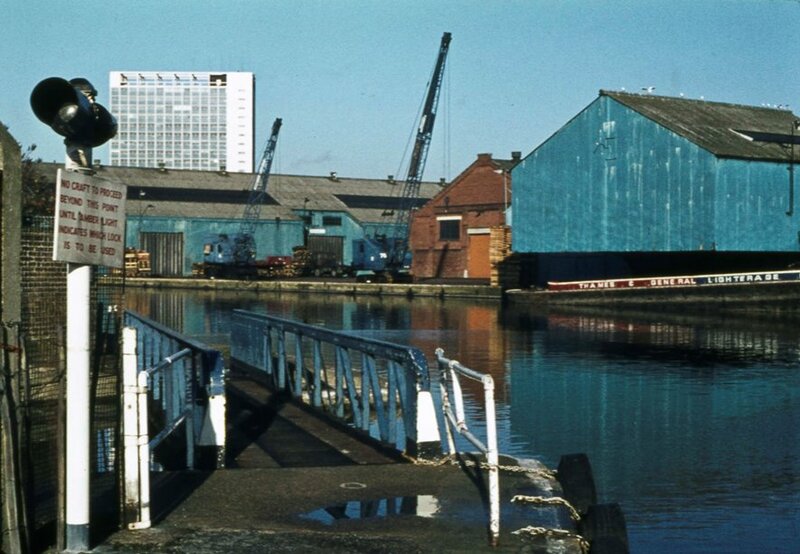 Just to the left is the Fellowes, Morton & Clayton Dock more recently know as the Lime Juice Dock when the boats carrying lime juice up to the Roses Lime Juice factory at Berkhampstead moored there. Actually it’s not really recent as it was the 1980s! Full list of Peter's photos which include several views of Brentford Dock, including handling of drums of lime juice (and more).